The world we live in today puts us in battles we are not typically prepared for: life-threatening diseases, child endangerment, loss of financial security, lay-offs, premature deaths, and home foreclosures. These problems aren't the kind we see on the usual exaggerated story-telling on television anymore. All of these scenarios are real -- and most of them may knocking on our doors. This reality puts us in a position where fear understandably shakes us and suddenly the faith in God that we claim to have gets tested and tried. 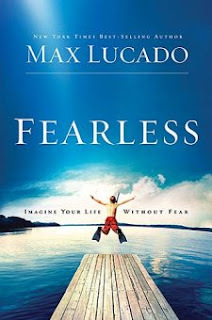 Max Lucado's newest book, Fearless, puts into perspective on how these situations measure up in an eternal standpoint. When we attempt to understand the point of view from above, we can truly ask ourselves -- can we live life without fear? I am known to be scared of the silliest things. Rats. Water slides. Driving in Metro Manila. But fear of the big stuff? Death. Parenting. Job loss. Not knowing what's next. Nah -- I can cope well with those. If I die soon (and my husband hates it every time I say this) -- I say, "Great. Earth -- peace out! It was a great life. Now I am off to see my Father and I am excited." I know how detached I might sound but I have really come to terms that my life here is temporary. I am going to make the most out of it. But when it's time -- then it's TIME. Now let me change it up a bit. Let me talk about my biggest heart issue. What if a family member forgets to call and check on me? Or a good friend gets caught up with his/her own life and just doesn't bother to spend time with me anymore? Or when I bring up ideas and it gets brushed off? Guess what -- that hurts me deeply. And it creates wounds in my spirit that I cannot even put into words. The book drove me into a deeper understanding that YES -- I may not be fearful of the obvious scary stuff but I am scared of a lot other things that cripples me just as much. Why do I grieve when I am taken for granted by people I love? Because I fear that at the end of the day, I do not matter. And that, my friend, also brings death to a life of victory Jesus Christ has bought for me. I am grateful that through this book, I was once again reminded that I do not need to strive for fear of insignificance. I am His -- and if I matter that much to Him, I am in a good place. A great place. I can't wait to sit down with my life group next week and go through Lucado's list of fears (which is dealt with chapter by chapter). What I talked about was just the one of many. I am excited to see breakthroughs in their lives as they understand that faith, not fear, is the best default reaction to life's storms.